The Dirty Dozen of grappling. The name says it all really. These are the nastiest, deadliest and nowadays oldest grapplers that you wouldn’t want to cross paths with. Let’s clear up a common misconception before going on. The Dirty Dozen refers to the 12 first black belts in BJJ that were of non-Brazilian origin. These were the first people to truly embrace Brazilian Jiu-Jitsu and turned out to be real monsters on the mats. One of the bunch is USA’s own Chris Haueter. He is a Rigan Machado black belt since the mid-90’s and one of the pioneers of Jiu-Jitsu. Now, you have the opportunity to learn from him wherever you are, thanks to digital video releases. Appropriately names Old School Efficient BJJ, this is a Chris Haueter DVD that you can’t miss! Chris Haueter is known for one of the longest BJJ seminar runs on a global level in the history of grappling. He is a top-class teacher that has the ability to make everything crystal clear. Chirs is a fan of simplicity and likes to stay the course of the original philosophy of Jiu-Jitsu. A Chris Haueter DVD is worth gold these days, given the quality and amount of information available. What’s best about it is that it is suitable for all levels of practitioners, from white to black. It is refreshing to go back to the roots of Brazilian Jiu-Jitsu and revisit the fundamentals under the tutelage of Haueter. Chris Haueter started off his martial arts journey as a karateka, before embarking on a wrestling stint. Following his high-school wrestling career, Chris joined the Marines and gave Thai Boxing a try. After a while though, he decided to go back to his grappling roots and through Aikido, found his way to a BJJ academy. Chris first walked into the Rorion Gracie academy, where he met Rigan Machado, who became his teacher. AS a pioneer of BJJ, Chris Haueter is responsible for the development of a few positions that we today take for granted. One such position is the combat stance, which is how his academy is named. These days, Haueter trains under Rickson Gracie, always looking to perfect his game. What you get when you buy the “Old School Efficient BJJ” Chris Haueter DVD is not just a BJJ release. You get the complete package with drills, strategies and MMA and real-world applications of Jiu-Jitsu principles. On top of that, he sticks to basic positions that everyone can do. More experienced students are going to find unbelievable details that’ll have them focus back on the old school and ditch berimbolos for a while. The DVD is spread across 4 volumes, each tackling a specific subject. Both top and bottom position techniques are covered, with the focus on effective finishing and correct positioning. A crucial element of the DVD is the focus on weight distribution as a weapon. From the bottom, Chris teaches how to disrupt your opponent’s balance by making them shift their weight. From the top, you’ll learn to be heavy as a buffalo, often causing people to tap to pressure alone. Haueter’s instructions are really easy to follow as he teaches the way he rolls – simple and effective. The first Chris Haueter DVD begins from the closed guard, in true old-school BJJ fashion. However, it is unlike any other closed guard instructional you might find. Chris has elements of self-defense sprinkled along, which are going to be extremely helpful for MMA fighters and people looking to protect themselves in general. Submission-wise, the cross choke is dissected so much that even Roger Gracie might learn a thing or two. Chris does not stop at the closed guard and goes over a few open guard variations in this volume. 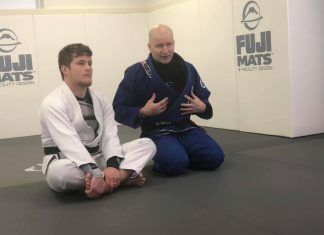 The spider, butterfly and De La Riva guard are simplified and explained in a way that makes them applicable to anyone. Furthermore, you’re going to get crucial insight into the principles of countering guard pass attempts, including the notorious over under pass. The second volume flips thing around and puts you on top. Once again, it is all about simplicity and effectiveness. There won’t be any cartwheel passes that’ll lend you in a gogoplata from the mount. However, there are extremely efficient ways to pass most of the toughest open guard variations. First of all, begin stuck in the closed guard is quickly going to become a thing of the past. Chris sheds new (or old-school) light on the most fundamental guard opening in an astonishi8ng demonstration. Furthermore, once the guard is open, Chris doesn’t rush straight into passing. Instead, he offers you passing concepts according to the way your opponent reacts. It is a concept that is surely going to work, opposed to just one technique. Of course, there are also a few passes explained in detail so that you have enough weapons when you apply the passing concepts. In the side control series of the Chris Haueter DVD, the focus is on controlling the top positions after you pass the guard. Do you sense the connection here? The first DVD started off from the bottom offering submission and sweeping options. Once on top, DVD 2 took us over passing concepts and variations. Finally, the third volume is going to focus on the most dominant top positions that you can find yourself in. Weight distribution from side control, brutally painful knee rides, essential mount details, anaconda-like chokes from the back. Whatever you think about, you’ll find in this volume. Once again, be prepared for the old-school approach of simple works best. Chris goes over all the positional nuances that are going to make you akin to an immovable object from all top positions. Only then does he dwell into brutal submissions that nobody is going to be able to get out of. Finishing this exciting volume area a few crucial counters that are going to change your game forever. Disc 4 takes a very different turn from the previous three volumes. Here, Chris shares high-percentage strategies for everyone over 30. Competing in the Masters’ divisions requires a different strategy and Chris knows this better than anyone. He offers efficient tactics to set up a high-level competition game based on old-school principles. Furthermore, he goes over a few drills to help you develop an impassable guard. Regardless of the type of guard, you like to play, these drills are going to have a positive effect on your game. even more so, they’re going to help you perform the techniques from the first disc much more easily. To wrap things up, Chris connects all the dots for effective MMA application. Once again it is all about concepts, old school efficient ones, that all but ensure victory in the cage. After all, they have been polished and tested for decades now by some of the best grapplers in the world. Now, you have a chance to learn them from the man that was there when they all got developed. What are you waiting for?